Living in an age of information overload, one should be glad about reviewing a book with sparse text, large visuals and plenty of white space. 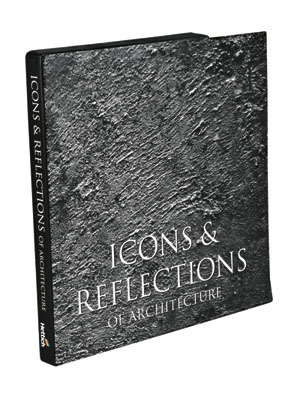 Yes, that’s what the chief merit of Icons and Reflections of Architecture is. A publishing venture by Hettich (global giant that manufactures furniture fittings), this coffee-table tome on 10 Indian architects is printed on high-quality paper and comes in an impressive size. Wish the same attention had been paid to the writing and visuals, all of which attempt to pay tribute to a select group of Indian architects. There is no explanation behind why Brinda Somaya, C.N. Raghavendran, C.P. Kuckreja, Gopi Bhawnani, Manit Rastogi, Mohit Gujral, Ranjit Sabikhi, Ratan Batliboi, Shakti Parmar and Sonali Bhagwati are the chosen icons. Although there’s no personal quibble with the selection, one would have liked to understand the reasoning behind the list. Are these the architects who best represent India today? Surely, the might (read portfolio) of these architects lies in the fact they are representative of post-modern Indian architecture. But instead of a quote by every architect placed in the centre of a page in a large type, what would have been more revealing is a dialogue with all architects highlighting their methods, materials and thought processes. A larger (visual) catalogue of their works would have made readers familiar with a substantial body of work. The skimpy arrangement that the book displays, is simply not up to scratch because one is left wanting to see and read more. Although we have become much better at documenting our spaces, we need to invest more in the present, in order to learn from the past and invest into the future of Indian architecture. I say this as a journalist who has been tracking design for several years now. Hettich is to be lauded, simply because tomes on Indian architecture are rare. Rarer still are books dedicated to present-day architecture. What would be welcome is a series of contemporary works by Indian architects but presented far more substantially than this volume.